Everyone deserves a smile they're proud of – and at Hamilton, Wilson, & Hendrickson Orthodontics, our mission is to help you achieve one! We're proud to offer a wide range of orthodontic treatments to patients throughout Lawrence, Topeka, and the surrounding communities, and we strive to make treatment as convenient as possible. 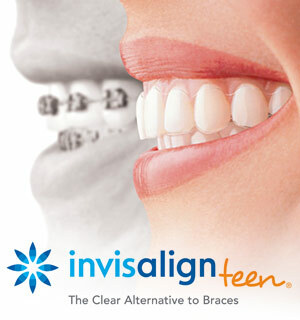 That's why we're proud to offer our teenage patients one of the most convenient options on the market: Invisalign Teen! Invisalign Teen is based on the revolutionary Invisalign System. Invisalign uses a series of clear, removable aligners instead of brackets and wires to straighten teeth. The aligners are almost impossible to see when worn, and because they're removable, it's easy to take them out for eating, brushing, and flossing – and in addition to these built-in advantages, Invisalign Teen has been specifically designed to suit the teenage lifestyle! The Invisalign Teen treatment process is simple. Instead of braces, your child will wear their clear, removable Invisalign aligners for 22 hours a day, removing them only to eat, drink, brush, or floss their teeth. Your teen will wear each set of aligners for 2 weeks before moving to the next pair, and with each new set of aligners, your child's teeth will move closer to their final positions. Throughout the process, we'll bring you in for check-up appointments every six weeks or so. Once your child finishes with their final pair of aligners, they'll have a gorgeous new smile for a lifetime! Almost impossible to detect when worn – no braces for prom or school pictures! For adolescent orthodontic patients looking for a convenient, discreet option for orthodontic treatment, Invisalign Teen is one of the best options on the market. And if you think Invisalign Teen might be right for your child, we'd love to help! Request a consultation today using our easy online form. We'll help you and your teen understand the current situation, review all the available treatment options, and choose the best treatment for your lifestyle. We can't wait to help your teenager achieve a beautiful, healthy new smile through Invisalign Teen!